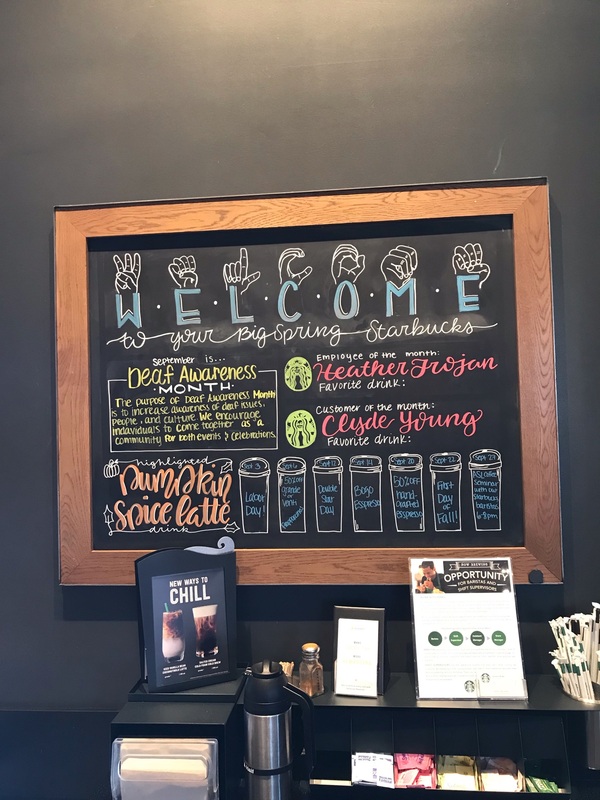 SWCID Promotes Deaf Awareness Month at Starbucks! SWCID is proud to acknowledge Deaf Awareness Month throughout September. This is an awareness event observed nationwide in many communities. We are thrilled to promote our Deaf Awareness Week in the Big Spring community September 24th through the 28th. There will be an American Sign Language (ASL)/Deaf Night Out at Starbucks on September 27 at 6-8 p.m. to socialize with deaf, and hard of hearing and hearing people. SWCID Alumnus, Heather Trojan, is an employee at Starbucks and will be our deaf barista. It will be a wonderful opportunity to meet and enjoy drinks at Starbucks with us. We hope to see you all there.